Davide Sottara has been working on the foundations for a Drools partial data reasoning, for his Phd, with Uncertainty Systems to express truth degrees. He's made a small screenshot for us along with the proposed syntax. 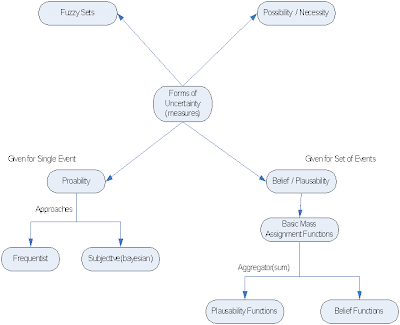 The idea is that different uncertainty systems can be configured to handle different evaluators for a given object type and field name - making it seamless to the rule language, beyond the notation shown. Geoffrey De Smet has been busy working on the Drools Solver module, which will hopefully be part of the next major Drools release. Drools solver aims to efficiently solve search based problems finding a valid solution from large search areas. It currently provides implementations for Tabu, simulated annealing and Local search. I personally hope to expand the system for Genetic Algorithms in the future, I'll have a good look at jgap too see if we can provide true value over existing systems. Geoffrey has started to flesh out the manual and is looking for feedback, it focuses on explaining the engine via solving the N-Queens problems. Drools Solver provides a framework for searching and uses Drools to provide the scoring, moves themselves are still done in Java code. I know that Geoffrey long term is hoping to have the move instructions also as part of the DRL. Kris and myself will be at Synasc 2007, where there will be a 2 hour intermediate Drools session with a focus on declarative programming. Edson and myself will be attending both conferences, I'm also on panel with a preliminary title "Rule Interchange and Applications:Practice and Opportunities". We have for some time been using the MVEL expression language magic, from Mike Brock. This has served us well, but I found that it has some funky features like "soundex" built in. This allows you to match text based on the soundex algorithm (ie a word sounds like another word). You can of course do this in predicates/eval (along with other cool things that MVEL has hidden in it). Handy ! I'm just updating the Fibonacci example as we overhaul and start to document drools-examples. For a bit of nostolgia I thought I'd show how Fibonacci looked 2 years ago with Drools 2.0 and how it looks now with Drools 4.0 and the new MVEL dialect. Diego Adrian Naya Lazo has just published an OSWorkflowBook "OSWorkflow: A guide for Java developers and architects to integrating open-source Business Process Management". What I found more interesting is that a non JBoss workflow engine put in a chapter about Drools integration, but the JBoss jBPM book "Business Process Management with JBoss jBPM" didn't. I did notice that the book refers to us as just Drools, I hope somewhere prominently in the chapter that JBoss are given credit.